Taste test: When I opened this bag, I was taken by surprise, as it contained wide-rippled potato chips, rather than the narrow-rippled chips pictured on the bag. For the first few bites, the flavor didn't have a whole a lot of resemblance to Buffalo wings, but it was tangy and tasty. As I ate more, the taste did get closer to Buffalo wings, but it still wasn't a very close match. There was also no heat, but the flavor was good, and it worked well with my peanut butter and jelly sandwich. Most of the chips in this small bag were on the small side. 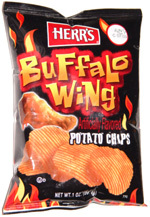 Smell test: Not like Buffalo wings. Maybe, maybe remotely like hot sauce.